Processors are created to run at a variety of different TDP (thermal design profile) levels, depending on their intended market. Processors meant for desktop computers can afford to have a higher TDP, while notebooks, mobile devices, and tablets tend to use processors with lower TDP values, due to the difficulty of cooling the chip down. According to Intel Ark, the processor manufacturer's specifications website for all of its chips, the 2.9GHz Core i9-8950HK has a TDP of 45 Watts, the same TDP as the Core i7-8850H and Core i7-8750H. The TDP itself is low, so it in theory shouldn't require an excessive amount of cooling. 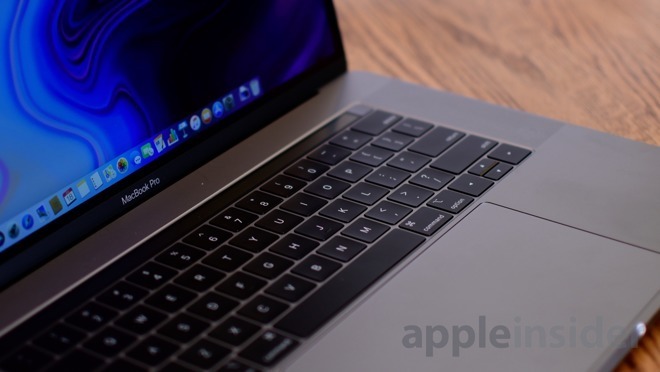 Notably, the 45-Watt TDP of the three processors used in the 2018 15-inch MacBook Pro line is the same as for the 3.1GHz Core i7-7920HQ, the processor used in the 2017 MacBook Pro. But, published TDP is based on base frequency, not the heat load that it generated when at turbo speed. While a processor is cool, it will exceed its normal operating clock speed up to its boost speed. This generates more heat, of course. As that heat builds, the processor will slow down to help dissipate the heat in conjunction with the cooling system. It can even go lower than the normal operating clock speed if need be to prevent damage. And, that slowdown to lower than the normal operating clock speed is what is happening in the i9 when the user slams the machine with a big load. There are work-arounds that users can apply. Maybe. A word of warning first. If you do decide to apply any of these user fixes, especially software settings, do so at your own risk. We've been looking at Volta since our article on the issue last week. In short, Volta allows you to set the maximum power that the CPU can consume, keeping the clock speed, and as a result, heat, down to manageable levels. Volta is not a new app, and the developer is responsive to user requests. 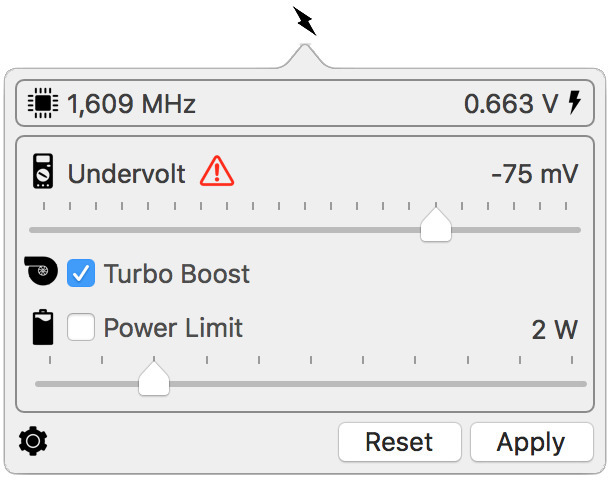 In fact earlier this week, a new version of Volta appeared, allowing users to allow the processors to consume more power, ideal for the i9 in the MacBook Pro. However, the utility requires a custom System Integrity Protection state to install and run. This may or may not be a deal-breaker for any given user. Volta is available from the developer. It is free to try, but sells for $5.99. Verdict: Minimally invasive, but still potentially a problem for system stability and usage if you choose to change processor voltage. Don't do it if you don't know what you're doing, because you can cause problems and file corruption if you alter some parameters too far away from defaults. AppleInsider briefly discussed Volta, and this entire saga, with The New Screen Savers over the weekend. Our recommendation from then still stands —do not do this if you do not know what you are doing. Apple will not repair an otherwise warrantied machine damaged by this utility, or any other. Over the weekend, a Reddit user claimed that the issue wasn't directly the CPU thermal condition, but the voltage regulator on the motherboard. By setting a few parameters in the Terminal, the user appears to have smoothed out the issue. But, as with everything else, thermodynamics can't be completely defied. If you're considering this, hit the Reddit post. It's basically the clearing house for the information on the voltage regulator module. Verdict: It's not even clear that this is the problem, yet. The Terminal command isn't permanent, but that's a good thing —if you completely hose something, you probably won't break anything permanently. If you do this, be absolutely sure to follow the directions to the letter. 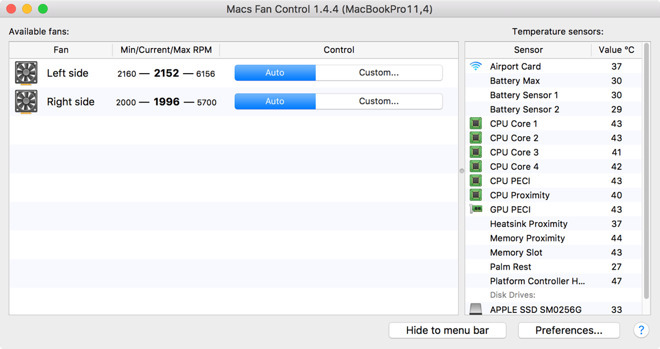 Macs Fan Control, and another called SMC Fan Control have been around for a while, allowing users to tweak the fan settings on a Mac. Honestly, we've never been big proponents of either. Until now, if you had a problem with frequent overheating, it was a fairly reliable indicator of a maintenance issue, like clogged vents or a fan that wasn't working. The i9 situation hasn't really changed our minds on the utilities as a whole, but they are one way to address the heat problem, if not the root cause. Macs Fan Control is also only available from the developer. It is presently free, but the company is asking for a $14.95 payment to support the development of the app. Verdict: This is by far the least problematic work-around from a "causing more problems than it fixes" standpoint. By starting at a cooler temperature, it takes longer for the machine to get hot enough to throttle the processor. That said, with enough CPU load it doesn't solve the problem, it just puts it off for a minute or two at the expense of increased noise. How much the noise matters is left as an exercise for the reader. This isn't really a solution, but it is an option. Apple's own apps, like Final Cut Pro and Logic, don't slam the processors quite as greedily as apps like Adobe Premiere or Handbrake. It isn't a be-all-end-all fix, and if you don't own them already, it isn't a cheap solution. But, it is a possibility. Verdict: Not practical for everybody. Plus, under sufficient load, you'll still get the down-clock after a time, even with Apple's applications. This is also not a solution, and just improves the thermal condition. When the MacBook Pro isn't using the internal GPU, and the video processing for the unit is off-loaded to an eGPU, the throttling isn't as severe and profound slowdowns don't happen until later. Given our trials, the best way to do this is to put the MacBook Pro into clamshell mode. This basically disables the onboard GPU, assuming that the external monitor is connected to the eGPU, and there aren't any monitors connected with USB-C directly to the machine. If you're going this route, while you're at it, get a vertical stand of some sort. Heat is dissipated somewhat more by the bottom case in this orientation. The lid shut doesn't appear to worsen the head dissipation in either orientation. Verdict: This is expensive, and can be loud. Count on spending at least $600 for a build-your-own eGPU with an enclosure from Sonnet, Mantiz, or Razer, or $699 for the much quieter Blackmagic eGPU. And, that's assuming you have an external monitor. We love eGPU technology, and have been talking about it for well over two years. This technology has the benefit of bringing a better GPU to the MacBook Pro when you're at a desk, and possibly USB-A and Ethernet —but it isn't for everybody. Did we mention it can get expensive? It also isn't a real solution to the thermal situation, just a work around to cut back on the heat generated inside the MacBook Pro. Put it in the freezer! We're going to skip the convention we started at the beginning of this article, and directly tell you up front to not do this. Cold metal, which you will get in some location on the MacBook Pro, will condense moisture in the air when you remove it from the freezer. This condensation will form mostly on the outside of the case, but a fair amount will also form on the inside. This is a profoundly bad thing. Verdict: Don't do this. Ever. Seriously. 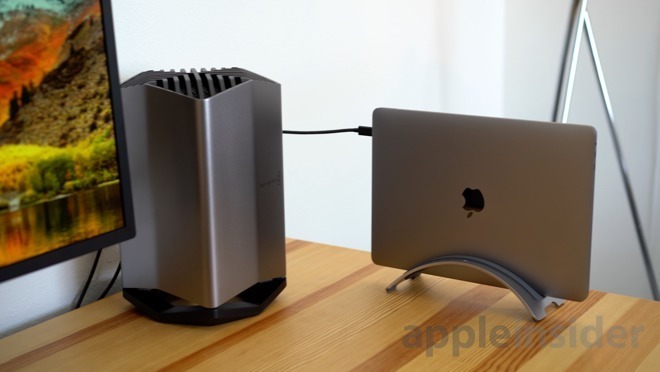 First of all, we don't really recommend any of these solutions as a cure to the thermal situation with the 15-inch MacBook Pro. Some are dangerous, some are stupid, and some don't really help. Well, we recommend an eGPU, but for many reasons, which we've already delved into. The fact that it has a non-zero positive effect here is just icing on the cake. If you can improve your own local thermal conditions, like ventilation or ambient temperature, do so. If there are voltage or power limitations to apply, let Apple do them in a future advertised or silent software update. AppleInsider has been asked a thousand questions about this daily. Questions have ranged from software optimizations and solutions like we've pointed out here, to asking about stands to help the thermal condition, and an uncomfortable number of them coming in with over-the-top variations of "how could Apple could betray us this way" hyperbolic pontifications. There is no such thing as a perfect product for every aspect of use, ever, in any field. There are compromises in every product, in every step of design, and priorities that get applied during development. Apple's priorities are made based on most of the market it services. While AppleInsider readers sometimes think that they are Apple's biggest audience, and would generally be willing to accept a thicker machine, Apple's actual larger market —meaning not AppleInsider readers —is demonstrably not. The thermal situation is an issue for "us." It isn't one for everybody, with every work flow. It won't be an issue for every "Pro." How much of an issue it is for any given user depends very much on the user's work flow, and what they need, in much the same way Thunderbolt 3 using USB-C as a connector is fantastic for some, and the worst possible blight for others. Thermals or not, the machine is a "Pro" machine, whatever that really means. It is not a bad or fatally flawed one. It is also the fastest laptop Apple has ever made, and can stand toe-to-toe with the iMac Pro in many workflows. But, it could be faster, and Apple has already taken steps to fix the problem. And, the patch seems to have fixed most, if not all, of the performance cut.